Train derailment highlights a significant lack of oversight over the shipment of oil via rail, but that’s only one of the hazards of the North American oil boom. A debate about the relative merits of transporting crude oil by pipeline or by rail reignited over the weekend, after a runaway freight train carrying seventy-two cars of oil exploded and leveled Lac-Mégantic, Quebec. 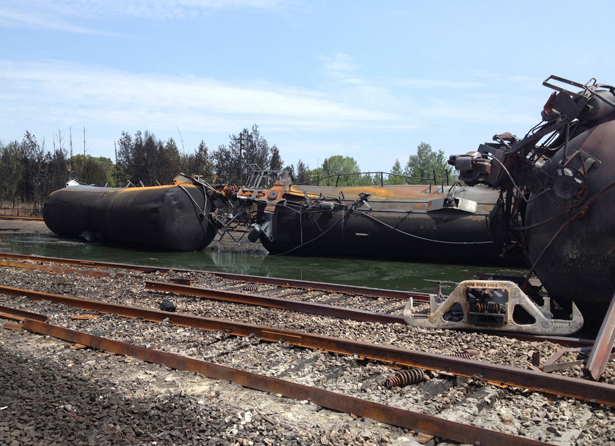 The disaster exposed a significant lack of regulation governing the shipment of crude oil via rail, and raised questions about the continued use of old tanker cars known to be unsafe. The volume of crude carried via trains has grown exponentially in recent years, as the amount of oil flowing from the Bakken formation in North Dakota and the oil sands in western Canada outstripped existing pipeline capacity. With new pipelines like Keystone XL caught up in the permitting process, freight rail infrastructure expanded to accommodate the glut of new oil with little oversight. The volume of crude transported by train in North America jumped by about 250,000 barrels per day last year. BNSF Railway, which controls many of the rails in the northern US from Chicago westward, increased its haul of crude from the Bakken by nearly 7,000 percent between 2008 and 2012. Manufacturers are churning out tank cars, oil companies are building loading facilities, and refineries and ports, particularly in the Pacific Northwest, are upgrading to accommodate the surge in rail shipments. In Washington State, crude-carrying locomotors arrived in the fall of 2012, after refineries in Anacortes and Takoma built new rail yards. While the state has a regulatory and safety framework for the millions of barrels of liquid petroleum shipped via tanker or pipeline to ports on the coast, the system is not designed to prevent or handle oil spills around railways further inland, according to Curt Hart, a spokesman for Washington’s Department of Ecology. “We have very limited regulatory authority over rail, and this is true for all of the states. We can’t tell railroads where they can take freight, [and] we can’t tell railroads what they can bring in as freight,” Hart said. It doesn’t appear that federal regulators are doing a particularly good job. One clear safety oversight is the continued use of DOT-111 tanker cars despite repeated warnings from inspectors. Canada’s Transportation Safety Board put it bluntly in a 2009 report: “The susceptibility of 111A tank cars to release product at derailment and impact is well documented. The transport of a variety of the most hazardous products in such cars continues.” These tankers make up about 70 percent of the US and Canadian fleet. Federal rules governing rail-born crude are written by the Department of Transportation’s Pipeline and Hazardous Materials Safety Administration and enforced by the Federal Railroad Administration. However, rail companies designate their own personnel to inspect freight cars and track lines, and while PHMSA said it would adopt stricter standards for new DOT-111 tankers, the agency has not stopped the use of existing cars. Citing costs, industry has resisted recommendations to retrofit existing models. Pipeline advocates have been quick to capitalize on the exposure of these serious safety lapses in their efforts to distinguish between pipeline and rail options for transporting crude. “The incident underscores the need for vital pipeline infrastructure, like the Keystone XL, to move more product to market in both the U.S. and Canada,” North Dakota Senator John Hoeven said Monday. But similar oversight problems plague pipelines, which are governed by rules largely written by the oil and gas industry itself and enforced by the understaffed PHMSA. “We’ve seen dozens of pipeline spills in last few years. Regulation to prevent them from spilling is not good,” said Stockman, who noted that while spills from pipelines are usually less dramatic than the explosion in Quebec, consisting of slow underground leaks that can go unnoticed, recent spills in Arkansas and the Kalamazoo River illustrates how devastating they can be.